When you need a white hand towel made from 100% cotton that can withstand endless trips through the washer and dryer while keeping its size and shape, Towel Super Center can help. 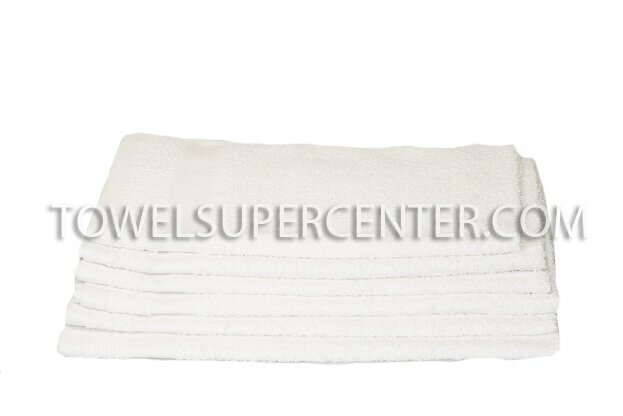 Towel Super Center is the online destination for wholesale prices on bulk orders of 15 x 25 hand towels. Perfect for businesses of all kinds, our premium white hand towels absorb and dry fast, but they stay soft and fluffy. Buy yours today! Think your customers don't notice the hand towels you use during your workday? The truth is that they absolutely do. That's why you should rethink using old, frayed or discolored towels. Instead, use new wholesale hand towels that will look and perform their best use after use. Don't leave anything to chance, especially in an era where one negative social media review can bring bad press. Re-stock your linen cabinet with affordable white hand towels made from cotton fibers. They're not just practical. They're also your secret marketing and first-impression tools! Have you had trouble keeping your white hand towels looking their best in the past? These 100-percent cotton hand towels can stay fresh and attractive wear after wear with a little help. Follow these tips for keeping your hand towels looking and smelling great. Pre-treat any stains immediately: This step helps release the stain from the cotton fibers. The faster you can toss pre-treated towels into the washing machine, the better the chance that they'll come out without any discoloration or spotting. Use a detergent with a bleach alternative, not bleach itself: Chlorine may get your white hand towels bright, but it breaks down the cotton fibers over time. Choose a bleach alternative instead and get more mileage out of your hand towels. Take your towels from the dryer immediately: They're at their fluffiest at that point and can be folded, rolled or used right away. Better towels for less money. High-volume businesses love our hand towels because they can wash and dry them again and again without worrying about quality. Longer, denser fibers make our premium towels fluffy and soft, but it also helps them keep their size and shape. They're incredibly thirsty, too! All the towels you need, no matter what business you run. Browse our online collection, and you'll discover a huge selection. We carry economy, premium and premium-plus towels in numerous sizes. You'll also find towels in white, black and all the colors of the rainbow! Match your décor affordably and easily when you shop at Towel Super Center. Low prices on big orders. Buy more and save more with us, where you'll find premium white hand towels as low as $7.99 per dozen. You'll also save on shipping because we pack our towels tightly for delivery. A huge selection of towels at wholesale prices makes Towel Super Center the preferred destination of savvy businesses. Good soft quality hand towels, great price works perfect for our need!